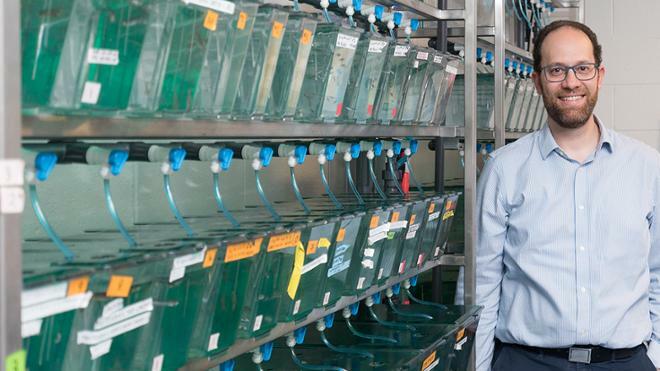 University of Richmond biology professor Isaac Skromne has been awarded a $400,000 grant from the National Science Foundation for a project using zebrafish to explore the development and evolution of cells in the central nervous system. Skromne, along with two UR undergraduate student researchers, will use zebrafish to study how neural progenitor cells, the stem cells that give rise to the neurons of the nervous system, decide whether to become part of the spinal cord or the lower part of the brainstem. This work aims to produce the first comprehensive roadmap of the signaling networks coordinating how a cell decides what to become within the central nervous system. Skromne notes that understanding this process could have implications in diagnosing and treating congenital neurological diseases, or spinal cord injury or degeneration. Zebrafish are ideal subjects for this type of research in part because the embryos are transparent, so you can see what is occurring inside the body. Skromne is also working on a research project with zebrafish that explores administering medication directly to bones and allows for exploration of possible solutions for reversing the effects of bone diseases, like osteoporosis. This last project is supported with funding from the National Institutes of Health – National Institute of Arthritis and Musculoskeletal and Skin Diseases. Learn more in this media release. He has taught at UR since 2017. The National Science Foundation is an independent federal agency created by Congress in 1950 to promote the progress of science; to advance the national health, prosperity, and welfare; and to secure the national defense. NSF supports basic research and people to create knowledge that transforms the future. The NSF is supporting Skromne’s project, "RUI: Elucidating the signaling interactions that control spinal cord fate specification,” with a four-year $399,515 grant.